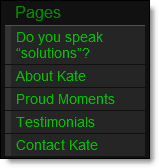 While Kate doesn’t maintain a blog, she did put in some very good effort into this site and continues to update it. Her references are from LinkedIn, she has her web site on all applications for positions, and she also refers to it during interviews. The site is used to reinforce her strengths throughout the interviewing process. That effort supports results in moving to the next stage in the interviewing process as well. Thanks, Jason — she really does get it and prospective managers have no idea how lucky they would be to have her on their team. Whoa! Imagine my surprise when I climbed out of the shower this morning and heard my husband Scot shout an expletive from the living room! Thanks for this award, Jason. While I’ve never been a devotee of the notion of personal branding, I knew that I needed to establish an online presence outside of the job boards and social networking sites. The site was modeled on Heather Henricks’ site, which won your award in November 2006. While mine is nowhere nearly as professional looking, it attempts to convey similar concepts, to wit: I have a value proposition, and I have the goods to back it up. As Scot mentioned above, my website is drawing attention. One recruiter who called me last week (and with whose organization I have a second-round interview coming up) actually asked me to speak to my brand as it’s articulated on the front page. I was floored, but I’ve also found that having the site helps me to refine myself better when speaking to my experience and value proposition both in interviews and in the application process. Much of the thanks for what the site has drawn my way goes to people like you, Jason, and to Scot, who’ve linked to the site one way or another. I have no intention of blogging….it takes too much discipline and I need to find a paying gig first….but I think the site is a valuable tool for people who are looking for quality talent in their respective workplaces. What a great post – and so ironic, I just purchased my name yesterday. I have a site for my business (www.jamiespnd.com) but now I am starting to license my art – and needed another site. As the artist, and the creator of my work it seemed like such a simple idea – one I should have done years ago. Oh well, better late than never I guess. I hope you find an awsome job. Again congradulations, and ‘go n-Ã©irÃ­ an bÃ³thar leat’!